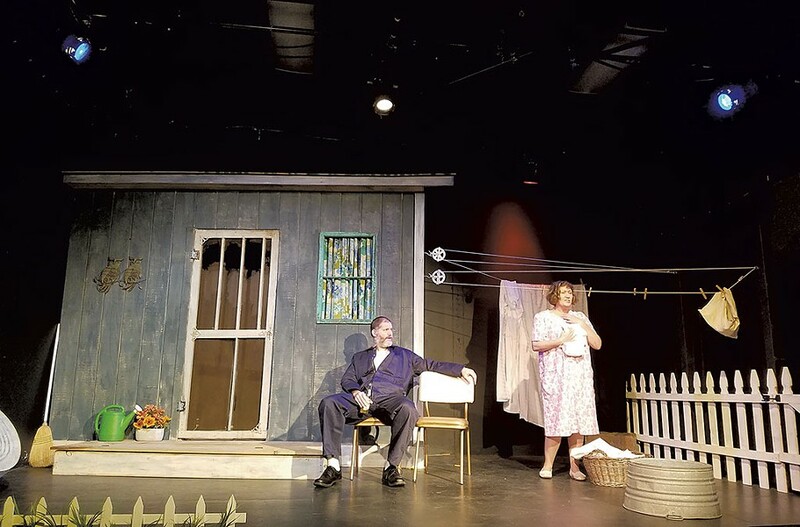 The Shoebox Theater production of The Stick Wife is a long, slow simmer of a play. Director Robert Toms lets the story unfold without hurry, but it assumes urgency from the emotional impact of superb acting. The six performers pause, misdirect, lapse into fantasy, blend realism with symbolism. Engrossing characters propel the play. The setting is Birmingham, Ala., in 1963. The action takes place in the backyard of Jessie and Ed Bliss' lower-class home. A gate in the fence leads to the street where neighbors Marguerite and Tom Pullet live. Betty and Big Albert Conner have a house farther away. The Bliss backyard is strung with clotheslines, and the screen door closes with a weary slap. A quiet, nearly secret sensuality connects Jessie and Ed. The play opens with her watching him pull his jeans from the clothesline and step into them. Her desire for him spills out over her face, but when he turns to look at her, she blanks her gaze to match his. When she asks him where he's going, Ed responds with silence. Her face clouds with worry and flat-out fear. The few words spoken tell us nearly nothing. If we can't be sure a threat of violence hangs over this marriage, we know that distance does. What draws Ed grimly out on a Sunday morning and leaves Jessie motionless with dread is the racial tension of the 1960s South. The white characters never speak directly about the reason they lock their doors, but the men know they have to do something about "them." The play's brooding, oblique storytelling makes it inappropriate for a review to describe the events straightforwardly; it's up to viewers to learn the secrets these characters live. Playwright Darrah Cloud builds a powerful portrait of white supremacism by writing characters who never speak the words of racism. They bury that language deep inside, and the secret loathing that animates them becomes both unreal and all-powerful. The typical way to tell the story of someone capable of racist violence is to explain it, pointing to the events that could cause it. Cloud's strategy is silence, giving the characters a rock-hard certainty. Their principles aren't abstract ideas; they're secrets. And they can lead to violence. The husbands are only marginally employed. The wives manage their anxieties the best they can. Betty drinks with steely dispatch, a flask always ready in her purse. Marguerite fidgets from too much of the "Co-Cola" she drinks and too little attention. Jessie develops a fantasy of seeing herself as a Hollywood star. The women hide from the news and the telephone, willing themselves not to know more about the world their husbands inhabit. The actors establish the dark turmoil of the characters by communicating in glances and gestures while speaking of superficial things. Cloud wastes no words, and even the gossip is dispensed in circumspect doses. Boiling beneath these laconic exchanges is a symbolic world of elemental fears. And some of them are realized in the play's second act. Jessie doesn't leave her backyard and is part of every scene. Tracey Girdich invests the role with honesty, letting the raw truth of Jessie's story drive both humor and solemnity. Girdich puts everything at risk from the opening scene, letting fear flood her as Ed sets off to a destination he won't reveal. When Marguerite visits and asks if she's heard the news, Jessie recoils. News of violence is her worst fear: "Don't you dare come close to me with news on you!" This potent blend of comedy and dread drives the play. Under Toms' direction, all the performers bring vulnerability and daring to each scene, connecting to make the action appear to arise in the moment. Girdich has a potent stare, but Aaron Masi, as Ed, can glare right back. Masi is threateningly large onstage, and his coiled potential for aggression pounds beneath his silence. Masi makes Ed an unapproachable menace, and the audience can share Jessie's concern about what he's capable of. Monica Callan creates an unforgettable character in Marguerite. The role calls for a woman on edge, and Callan takes her there without a single shortcut of superficiality. Marguerite jangles and jitters, struggling to control herself. Wearing glasses almost as an effort to protect herself from what she sees, Marguerite hides her face like a child and then runs home to Tom. She'd be nothing without her man, she says, and Callan shows us a woman so steeped in fear that she doesn't realize how dangerous her protector is. Gene Heinrich, as Tom, portrays an animal brutality in one scene and then a subtle transformation in another. Heinrich is eerily convincing as he explains his violent impulses as "coming into my power." He shakes and sweats as he recovers, then discovers himself in the role of oppressor. As Betty, Syndi Zook takes in the world with a watchful eye, scanning the horizon. Among the women, she reigns with cynicism and calculation, but when her husband points, she goes where he bids her. She's equally adept at comedy and drama, and she can wring laughs out of a glance and a little shudder out of her obedience to Big Albert. Todd Townsend plays Big Albert with one simple message: Don't cross me. His wild, powerful beard gives him a raw primitiveness, while his words are spoken with soft clarity. He towers over Betty as he returns from church, wearing a prim red tie and white shirt. Townsend makes everything he says sound like a warning that must be heeded. Cloud's script takes so many risks that it can't help but stumble a time or two. Toms' direction and these performances bring out its highest potential, but they're not enough to conceal every flaw. The second act contains some brilliant moments, but it could be described as all over the place, as if the play is proudly biting off more than it can chew. In the end, though, Cloud's characters are memorable, astounding people, and this production presents acting at its finest. The original print version of this article was headlined "The Evil Within"